Grandma’s Secrets: 5 Questions for Thoughtful Conversation. Guest Post by Carolyn Miller Parr. We want to listen to others who have wisdom to impart. We want to learn from someone with experience, with memorable stories to tell that will impact our own lives. We look to books, teachers, religious leaders, therapists, and even social media. We often forget to look closer to home. We often don’t listen to the people with whom we already share a story. My mom’s mom, my “Grams” lived with us for sixteen years after my Granddad died when I was ten years old. She was like a second mom to me and I adored her (though we were too stubborn and alike so fought often as well). But it wasn’t until her second battle with cancer that I realized my time with her could be short and I really started asking her about her life. I learned about how she met my granddad, what a rebel she really was in her time, and other amazing stories. But there wasn’t enough time. There is so much more I wish I would have asked. Carolyn Miller Parr, a retired judge, works as a mediator. In her mediation practice with Sig Cohen, she has discovered that families in distress more often than not experience pain from two main sources: broken family relationships, and a parent’s failure to plan for the future. 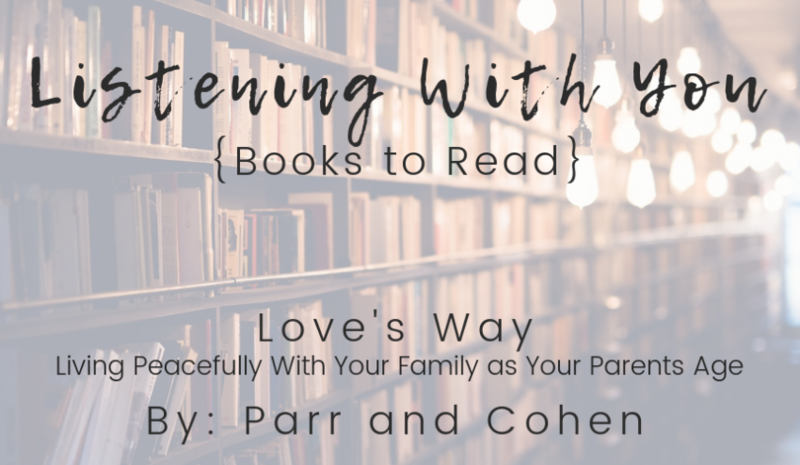 Their new book Love’s Way: Living Peacefully with Your Family As Your Parents Age is their answer to this problem. They encourage people to have difficult conversations with aging parents about practical matters like wills and their wishes. But there are other conversations we can have with aging family and elders as well.I need to learn a thing or two about listening well to those I love. Welcome Carolyn Parr today as she shares with us how we can start a conversation with an elder loved one in our lives. People in the last third of life have dynamic inner lives that their grownup children or grandchildren might never imagine. Next time you have an hour, here are some questions to ask your elder loved one. You may be amazed at the response. 1. How old do you feel in your spirit? An elder’s inner age does not comport with chronology. Inside, I’m permanently about 34 years old. It’s how I feel as I go about doing life. That’s about the age of the female characters in my dreams. When I was that age, my children were young and law school was still on the horizon, but coming into view. Today, I’m a great-grandmother and a retired judge. But I’m still shocked every time I look in the mirror. 2. What’s your greatest challenge now? Old people won’t usually discuss it with young people, but we’re constantly dealing with loss: career, health, physical strength, driving, memory, and even people we love. We take time to grieve and regret, but we can’t dwell in that space. To avoid falling into depression or ennui, we must develop resilience. We may become more introspective as we search for the meaning of our suffering, of our lives. Our losses can become material for deepening our inner growth. 3. What do you dread most about growing old? Some people might say “helplessness,” or “Alzheimer’s,” or “being a burden on my children.” To me, those are specific manifestations of an underlying loss of control. For as long as I draw breath, I want to be able to make my own decisions about where, how, and with whom I will live and how I will die. If I have a stroke or dementia, or another serious debilitating health issue, that won’t be possible. Then, I pray I’ll be able to accept my changed reality with grace and peace. 4. What’s your greatest fear? Fear is a kissing cousin of dread, but more acute. Elizabeth O’Connor, an author, personal friend, and member of my faith community, used to say she thought everyone’s greatest fear, no exceptions, was the fear of abandonment. Initially, I disagreed. Having been a caregiver for two close relatives with dementia, I had thought my deepest fear would be to lose my mind. I didn’t worry about abandonment because I have a husband and children I believe would care for me. If not at my home or theirs, they would at least be my advocate in an assisted living residence and visit often. But many elders are single and childless or live far from family members. And even the most careful plans can go astray. (Mike Tyson reportedly said, “Everyone has a plan till they get punched in the jaw.”) My 89-year-old friend, “Annie” bought a house on the same block as her two married children. The children planned to share Annie’s care as she needed more help. Now she walks very slowly and painfully with a cane. But, incredibly, both of her 50-something children or their spouses have cancer, and Annie has become the default cook and caregiver for the others, to the extent of her strength. 5. What’s the best thing about being old? Age, when we don’t fight it, comes bearing gifts. People are less prone to judge me. Since I don’t have to impress anyone, it’s easy to give up my false self and be real. If I want to wear white after Labor Day, I just do it. Others may think, “She doesn’t know better,” and that suits me fine. If I nod off during a boring lecture, someone may nudge me if I start to snore but nobody is scandalized. I recognize trash talk when I read or hear it and am unafraid to call it out. The older I get, the more comfortable I feel in both my skills – and my ability to say “no” if I want to. Some people may be surprised that I can work a Samurai Sudoku or travel unaccompanied, or grow beautiful flowers, or keep a tidy house. It’s okay for me to bring carryout to a potluck dinner. I’m invited by others without being expected to reciprocate. I can be excused from chores I don’t want, like making coffee for church fellowship. “I don’t have the energy” suffices as an excuse. The longer I live, the more occasions I have to be grateful. When I’m having a good day I notice, instead of taking it for granted. People are less competitive and more generous or kind. I’m often the recipient of unearned graces: Young women as well as men offer me a seat on the Metro, or hold doors open for me or carry my packages. When I thank them sincerely we both feel blessed. I can reinvent myself. Anyone who lives into the last third of life has overcome some hard things. My children give me pleasure and pride. I feel the satisfaction of a life well lived, of friends and family I have loved and lost, of giving and receiving forgiveness. And I still have a future, however limited it may be. Every day is more precious than the one before. But there is still time to create new friendships and deepen the ones I have. To read good books. To explore a road not taken. Still time to comfort others, to pray for others, to learn from others and maybe to share a little wisdom. I treasure my future more than I ever could when I was young, just because I know it’s limited. So next time you’re with an older relative or friend, find a quiet corner, share a cup of tea, and settle in for a great conversation! Carolyn Miller Parr, J.D., is a former judge and elder mediator. 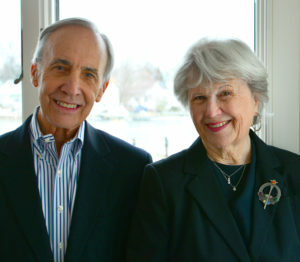 She writes articles on aging and intergenerational communication with her co-mediator, Sig Cohen, at www.toughconversations.net. 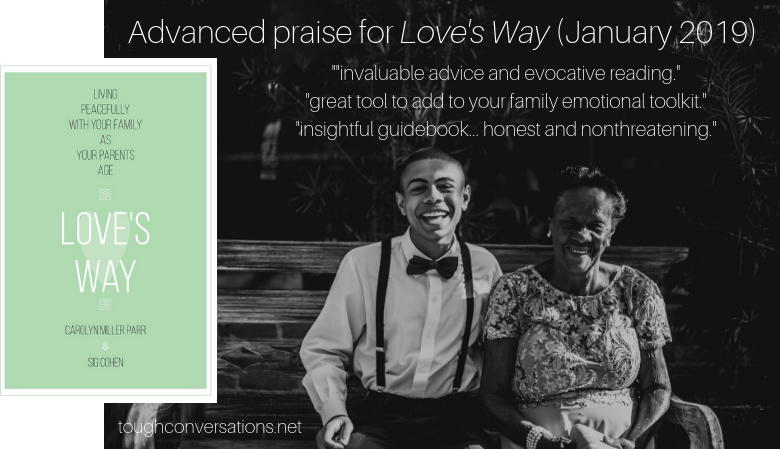 Their book, “Love’s Way: Living Peacefully With Your Family as Your Parents Age” is coming January 1, 2019 and can be pre-ordered now. See www.amazon.com/author/carolynmillerparr. I hope this spurs on some important conversations in your life.